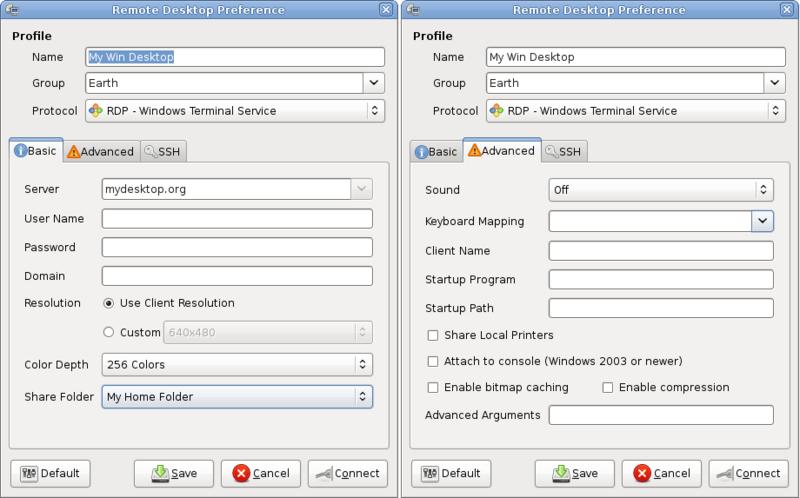 Remmina is a remote desktop client written in GTK+, aiming to be useful for system administrators and travellers, who need to work with lots of remote computers in front of either large monitors or tiny netbooks. Remmina supports multiple network protocols in an integrated and consistant user interface. Currently RDP, VNC, XDMCP and SSH are supported. 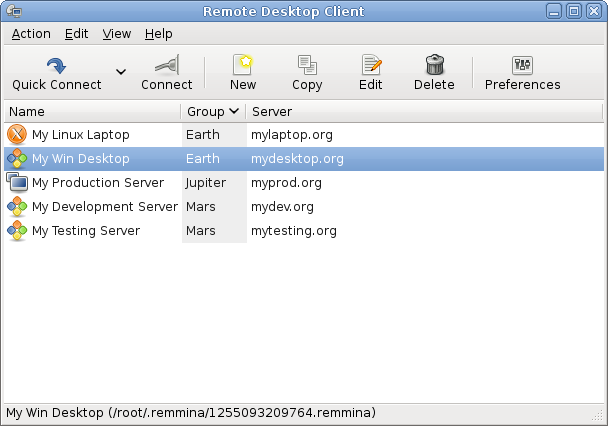 Remmina project comes with two separated packages. * A pure GTK+ 2.0 application! * Viewport fullscreen mode: remote desktop automatically scrolls when the mouse moves over the screen edge. * Floating toolbar in fullscreen mode, allows you to switch between modes, toggle keyboard grabbing, minimize, etc. I use mremote daily at work. I run ubuntu on one of my computers at home. I think this may give me the functionality that I have been missing with the rdesktop client. I’m using Remmina about 2 months. Do you run this on ubuntu? I also use Remmina almost every day at work. I have to connect to many different customers’ computers and servers and this piece of software lets me keep all of those connections very organized. Highly recommended! So does this only support opening SFTP connections to servers and not SSH terminals? will this work on ubuntu 8.04.x ? @Matt: You’re right. For ssh terminal sessions, you may want to try sshmenu and it’s applet sshmenu-gnome. It is really great! I need an open source application similar to secureCRT for connecting to linux servers and has the capability of saving user name and password. I like the look of this … pretty similar to Gnome-RDP … but some nicer options. One suggestion: in windowed mode, there should be a way to hide that huge toolbar …. takes up too much realestate in my view. If it could hide like it does in full screen mode, that would be the bomb! Remmina is great. Is there a way to save ssh password in it ? @Rozliczanie nfz: If you want instant ssh connections without typing passwords, put your public key into ~/.ssh/authorized_keys of the remote account. That way you will be able to authenticate without password with remmina as well as any other method. Of course, your ssh key may have a passphrase which may be cached by ssh-agent. @Ahmed: Secure CRT is now available (as beta) for Linux. Currently I have installed Remmina on Ubuntu 10 version, I have problem with sound audio, the sound was comes shortly and disappeared. anyone can help me for this problem. I installed ubuntu-11 and I am able to connect to remote Windows PC using remmina but after connection I am not able to type or use mouse on remote PC . Can someone help here ? i use it. works great.